GORDANA BIERNAT is the only European to have been named an Oprah Winfrey SuperSoul 100 Teacher. Her straightforward and empowering tweets have already inspired hundreds of thousands across the globe and this book is a collection of her most profound wisdom. 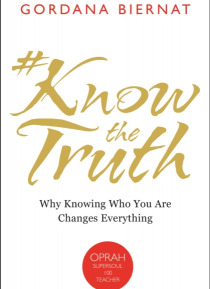 #KnowTheTruth will open your eyes to your true potential and inherent inner power; it will remind you of who you are and why you are here.All … the 'truth thoughts' in this book have ONE purpose - to help you understand yourself and your place in the world. The truth is never complicated or irrational; the truth always feels easy and right. If you have an unresolved issue or need guidance, just ask, 'What is my message for today?' then open this book and read the message it has for you.